Wondering how in the world you can get that perfect browning on your vegan baked goods? Vegan egg wash substitutes to the rescue! Vegan baking basics are BACK! It’s been a while since I’ve done one of these posts, but I’ve found they are super helpful for just navigating and figuring out how to do vegan baking best. 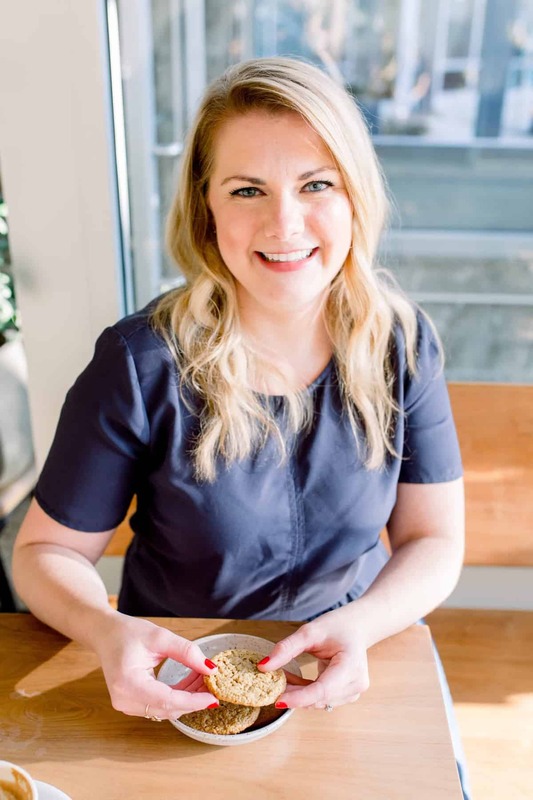 I’ve covered everything from baking with dates to the wonders of cashews and the process of converting a non-vegan recipe to a vegan recipe. I’m here to help you out! Now onto the business at hand, vegan egg wash substitutes! For a long time, while I was navigating the waters of vegan baking, I just kind of forgot about/left out the whole egg wash things on a lot of baked goods. Typically, egg wash is brushed on to put a little bit of browning on your scones or make sure your pies get deeply browned on top, which is really the signature of a pretty pie. The egg is beaten together with a little bit of milk and brushed onto the top of the baked goods, resulting in a shiny and lovely exterior that makes a sweet treat that much more appealing. So what’s a vegan baker to do without the trusty egg wash? I’ve found there are two vegan egg wash methods that work best: coconut oil or a milk/agave mixture that mimics the effects of a regular egg wash. The coconut oil wash is best for savory goods, like homemade soft pretzels or savory scones, since it doesn’t have a sweetness or flavor to it. Trust me, when you have savory goods, you want to do with the coconut oil wash, don’t even try the milk/agave mixture. I made the mistake of thinking the sweetness would just bake off (what was I thinking?!) when I brushed it onto a batch of savory scones and the end result was just weird. It was as if my taste buds were very confused about what I was eating. Was it savory? But there was sweetness too! It was very odd and resulted in a bust of a batch of scones. The coconut oil vegan egg wash method would also be perfect for biscuits or any other savory/bread baked good. The basic process of using this method is to melt 1-2 tablespoons of coconut oil and lightly brush it onto the tops of your baked goods, taking care not to use too much. The milk and agave mixture is something that I believe I found somewhere on Food 52. 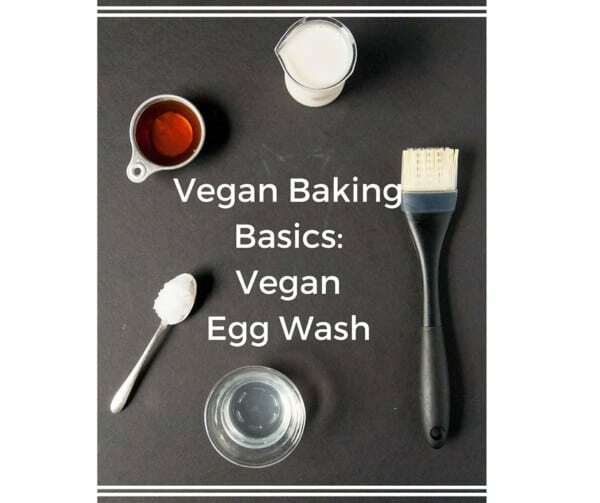 I can’t find it again at the moment (that’s what you get for Googling the crap out of something), but I know I came across a suggestion of whisking together a combination of non-dairy milk to agave nectar, resulting in a great solution for a vegan egg wash. The proteins in the non-dairy milk give the same effect as the eggs, creating a smooth sheen. The agave nectar adds that hint of sweetness and caramelizes when baked, resulting in the gorgeous light brown sheen that is the trademark on so many pies. I typically use about 2 tablespoons of almond milk whisked with 1 teaspoon of agave nectar, lightly brushed onto the tops of a pie or scones. You could probably sub in maple syrup in a pinch, but agave is light in color and doesn’t result in an overly browned color, which can sometimes end up looking burnt after baking. So now that you can make the tops of your pies all glossy and your scones looking fly with the easiest vegan egg wash substitutes, go forth and bake! Vegan Baking Basics: What Is a Flax Egg? Ooo I’m not vegan but I always like reading these posts it helps me think a little more outside the box for sure! Like now I’m a little more encouraged to bake something with a shiny crust (pie?!?!) even though my crust skills are totally laughable. You are so welcome Erica! I like that vegan baking forces me outside the box too, it just keeps things interesting right? Oh my, I laughed out loud about the sweet wash with the savory goods. I have so done that! These are great tips, Abby!! xo. Agh! I needed this a couple months ago when I ran out of eggs while making challah. Why didn’t I think to call you?! Have you ever tried aquafaba as an egg wash? It works well for me. I haven’t! I like something that is super quick, so sometimes going through the aquafaba process isn’t feasible, but I’m glad you mentioned it! Even though I’m not vegan I always hate wasting part of an egg when I need an egg wash (at almost $.50 each for organic). Will definitely give these ideas a try! I agree Inger, it’s good to have those tricks in your back pocket! Well I wish I had read this a few hours earlier! I just made a peach pie and was so wanting an egg wash! Next pie-thank you! Looking forward to trying it. The bakery where I work makes vegan versions of some items. For the egg wash we open up a can of cream of coconut and brush some on, and then brush with simple syrup after coming out of the oven. It does turn out extremely sweet, but nice and shiny at the same time. Ohh I’ve tried that version too and it works so well! What about for things like chick’n cutlets? I always just use mustard but I am not sure that is doing the trick.